Fig1. - Angle between vectors and scalar product. 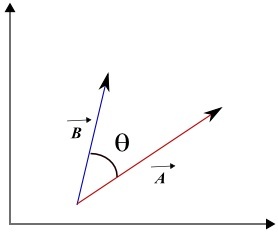 where | A | is the magnitude of vector A , | B | is the magnitude of vector B and θ is the angle made by the two vectors. The result of a scalar product of two vectors is a scalar quantity. Note that if θ = 90°, then cos(θ) = 0 and therefore we can state that: Two vectors, with magnitudes not equal to zero, are perpendicular if and only if their scalar product is equal to zero. A = (-2 , -b) , B = (-8 , b). AxBx + AyBy = 0. Two possible values of b; b = 4 and b = - 4 make the above vectors perpendicular. A = (2 , 1 , 3) , B = (3 , -2 , 1). We first use the components to find the scalar product of the two vectors. We next express the scalar product using the magnitudes and angle θ made by the two vectors. 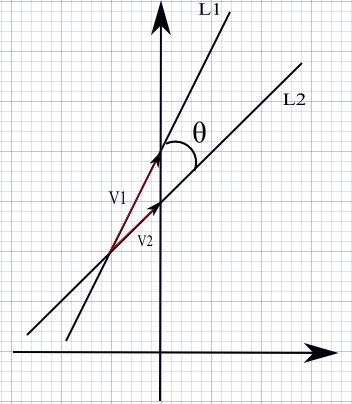 Given vector U = (3 , -7), find the equation of the line through point B(2 , 1) and perpendicular to vector U. A point M(x , y) is on the line through point B(2 , 1) and perpendicular to vector U = (3 , -7) if and only if the vectors BM and U are perpendicular. 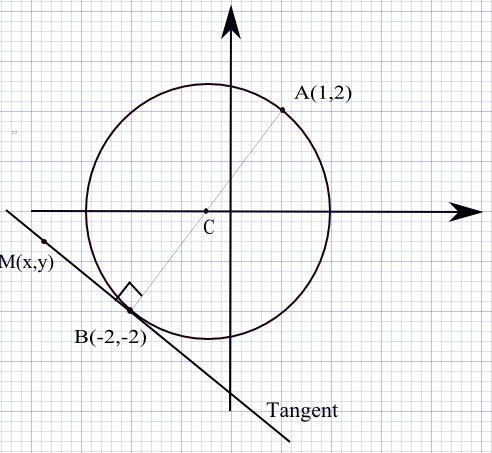 Given points A(1 , 2) and B(-2 , -2), find the equation of the tangent at point B to the circle with diameter AB. Fig1. - Tangent to circle. A tangent to a circle at point B is perpendicular to segment BC where C is the center of the circle (see figure on the right). Any point M(x , y) on the tangent is such that the scalar product BM·BC is equal to zero. We now use the fact that the scalar product is equal to zero. Expand and simplify to find the equation of the tangent. Find the angle between the lines given by the equations: y = 2 x + 4 and y = x + 3. Fig1. -Angle between two lines . Let L1 be the line with equation y = 2 x + 4 and line L2 the line with equation L2. First find the point of intersection by solving the system of equations: y = 2 x + 4 and y = x + 3.